Wisconsin State Quarters are the 30th variety in a series of fifty design changes over a ten year period from 1999 to 2008. This Quarter was released into circulation on October 25, 2004. Wisconsin is known for its corn fields and dairy farms, so it’s only fitting that the Wisconsin quarter feature the head of a cow, a wheel of cheese, and lastly, an ear of corn. All are closely related to agriculture and dairy, the two things that make Wisconsin what it is today. 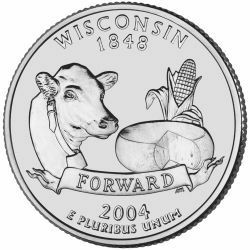 One of Wisconsin's mottos is "Americas Dairyland" but this is not used on the coin, rather the motto "Forward" is used. The reverse of the coin bears the inscriptions "WISCONSIN 1848”, "FORWARD" and "E PLURIBUS UNUM" along with the date of 2004.